The Mt Kosciuszko Incorporated is a non-for-profit Association of Polish emigrants, was established in Perth, Western Australia in 2002 to raise public interest in the early history of Mount Kosciuszko and P. E. Strzelecki's cultural contributions. The lowly objective presentation of the latest history of geographical discoveries in Australian school programs and some mass media is a challenge to patient information dissemination, based on archival sources, authoritative historical literature, especially in English, as well as in Polish. The surest way to achieve this goal is seen in the popularization of Paweł Edmund Strzelecki's form and merits in the local society as well as through the preservation of the historical truth about the mountain, its conqueror and the name given by it. „ Second sketch (…one of five which were possesion of James Riley z.l.) inscribed »Mt Kosciuszko the highest summit of Munyang in Australia. March 25th 1840«. It is obvious that Kosciuszko was the whole massif and not a particular peak”. The original sketch is in La Trobe Collection, State Library of Victoria. Please help us to build this „Mt Kosciuszko Inc.” website - send your material. We have an extensive collection of source materials, which we quote on our website, as well as scans of many books on P. E. Strzelecki, that we make available for to all interested parties.. If you want to put a link to english version our page on your website, just copy the code from the box below. The link will contain a ready graphic element of our logo. Also, please let our Secretary know (on the address below - contact us). Promote the materials of our websites! 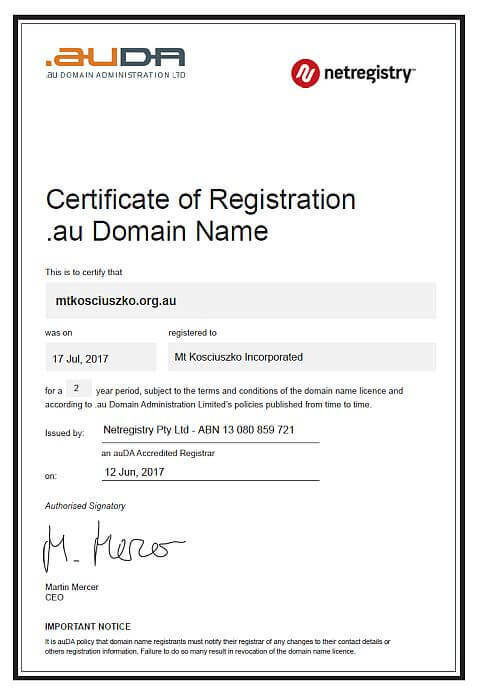 Anybody, who thinks that preservation of the name Mount Kosciuszko is necessary and would like to support financially the Mt Kosciuszko Inc., is most welcome to send a cheque / money order (AU$ - US$ or in another currency) written to the Mt Kosciuszko Inc. (please find the full account name in our Member's Declaration - it see on part below) to the address. Every individual donation helps us in our activity. Be part of it - join us now. Membership is open to all ages. Since 15 th December 2007 our official _representative_ in Poland is Mr. Zdzisław Leliwa. — the creation of a P. E. Strzelecki Museum in Australia. raising funds in support of the aims of the group/association, through, amongst others, membership subscriptions, and funds raising activities. You have an idea for other forms of our activity - send a message to the address in the Contacts section. We are seeking new members, as well as membership renewals to assist our organization. If you feel that you can contribute _ please - click _ & Contact us.